Send your warm wishes to your near and dear ones on the occasion of Janmashtami. 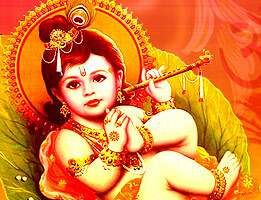 Go through the article to know in detail about Janmashtami Cards. Janmashtami, the birth anniversary of Lord Krishna is celebrated all over India with great fervour. Lord Krishna is believed to be the reincarnation of Lord Vishnu who took birth on this auspicious day on the planet earth. This day is rejoiced greatly by the devotees by observing fast, singing bhajans, performing special puja, etc. In addition to this, Ras Lilas and other religious plays are performed to tell the people about various deeds and life of Lord Krishna. Mainly, this festival is celebrated on a grand level in Mathura where Lord Krishna was born. The merriment of this festival goes on continuously for two days. Also, people send their warm wishes and exchange gifts among their near and dear ones like it is done at the time of the other festive occasions. Read the article to know more about Janmashtami Cards. Handmade cards are very nice option through which you can send warm wishes on the auspicious occasion of Janmashtami to your loved ones. Simply, you just have to be a bit creative and with the help of handmade paper, wax crayons, paints, pictures of Lord Krishna, glitters, sequins, etc. you can make a wonderful card. Also, you can search various ideas of card-making on the internet. Inside the card, write a touching and expressive message and some of the exciting facts about Lord Krishna. This will surely beautify the card. Thus, you can surely make beautiful handmade cards and send it your relatives and friends. Also, this type of cards makes a memorable gift. 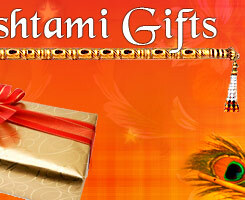 In these days, you will find various famous gift galleries including Paper Rose, Archies, etc. which has a huge collection of cards depending on the different festive occasions along with birthdays, marriage ceremonies, etc. The cards related to the festive time of Janmashtami includes various exciting stories and are beautified with the glittering pictures of Lord Krishna, thus the cards looks really very attractive. Thus, you just have to select a beautiful card of your choice with sentimental messages and send it your loved ones. E-Cards are the other most preferred option to send your cordial wishes to your closed ones on the festive occasion of Janmshtami. There are several websites such as 123greetings.com, ecardsforall.com, santabanta.com, etc. which offers the facility of sending e-cards. Also, there is the facility of mentioning your important details such as name of the sender, email id, name of the receiver, etc. In this, you can also write the soulful message and send the card. Your card will be delivered in very less time and thus, it is the fastest and reliable means through which you can easily send your wishes to the others. In addition to this, there are e-cards which are animated and looks very beautiful. In the e-card, it seems as if a movie is going on with the background music.